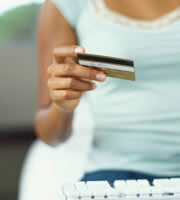 Credit cards could go digital. Literally! Last February, we posed the question: Is Cash Really Going To Disappear? We were talking about new technologies -- such as near-field communications (NFC) and peer-to-peer (P2P) money transfers -- that might soon eradicate the need to carry bills and coins completely -- or almost completely. Instead, we'd carry smart phones, tablets and other soon-to-be-invented electronic devices. It's these, which would be linked to our debit and credit cards, that would allow us to perform virtually all our day-to-day transactions without bothering either the Bureau of Engraving and Printing, or the U.S. Mint. But now four young people have come up with a way in which we could make fast (15 seconds, according to The San Francisco Chronicle), secure credit card payments, not only without our plastic, but also without so much as a single microchip. In fact, we would need only our own naked bodies. Because the new system, which is already undergoing small-scale field trials, uses fingerprints to identify the user, link him or her to the right credit card, and then authorize a transaction using existing payment networks, such as MasterCard and Visa. The idea of using two fingerprints -- rather than plastic, electronic smart devices, signatures, PINs and so on -- to process card payments came from a small group of youngsters who met while studying at Carnegie Mellon University (CMU). Like almost all truly great inventions, the one belonging to Christian Reyes, Brian Groudan, Kelly Lau-Kee and Mang Patel is awesome in its simplicity, and makes you wonder why you didn't think of it first. At least in movies, companies have been using fingerprints and other biometrics to control access to secure areas for many years. So why not scale that technology up for a consumer application, such as making available all that a credit card offers wherever you happen to be, regardless of what kit or plastic you have with you? Well, there's a big gap between theory and practice, and, although the fab-four came up with the idea last fall at CMU's TechLab start-up course, they only got around to beginning development when they attended a PennApps Hackathon at the University of Pennsylvania. It cost about $1,700 in off-the-shelf parts for them to build an initial prototype, including a card reader and fingerprint-recognition facility, although economies of scale would make production devices much cheaper. The four students have already become entrepreneurs, and you can today find their website PayTango online. However, for now, they're just inviting interest from those who want to sign up for information when the service becomes more widely available. Will there be a rash of robberies in which rich people lose fingers so criminals can use them until they (the digits) finally decompose? Will there be a fashion among less wealthy social climbers for cosmetic finger amputations? "This is crazy sci-fi Big Brother stuff." Yeah. And you're on TechCrunch why? Won't there be too many false positives and false negatives to make this technology workable? Haven't there been previous attempts (Pay-by-Touch and Tip2Pay) to achieve similar goals, and didn't those fail? What happens if you have six or more cards? Will you have to use your toes? Will sales of gummy bears rocket, as these can be very effective at capturing fingerprints for onward transfer to prostheses? Is that why you so rarely see billionaires eating gummy bears? It would be good to think that the PayTango team already has its its collective head around some of these questions. Certainly, Reyes, Groudan, Lau-Kee and Patel are likely to encounter issues as they roll out their current installed base of three CMU dining facilities to various Silicon Valley conveniences stores, gyms and restaurants -- and soon to other universities and beyond. But their basic concept seems so sound. One day, surely, people are going to be able to securely make payments using their credit cards, regardless of whether they left their smartphone or wallet at home. Right now, biometrics have severe limitations, and some believe those flaws are inherent. But technology has conquered supposedly insurmountable challenges that were much more "impossible" than these. And wouldn't it be great if these four smart kids from CMU were the ones to bring a whole new way of paying to the world? 0 Responses to "Credit cards could go digital. Literally!"